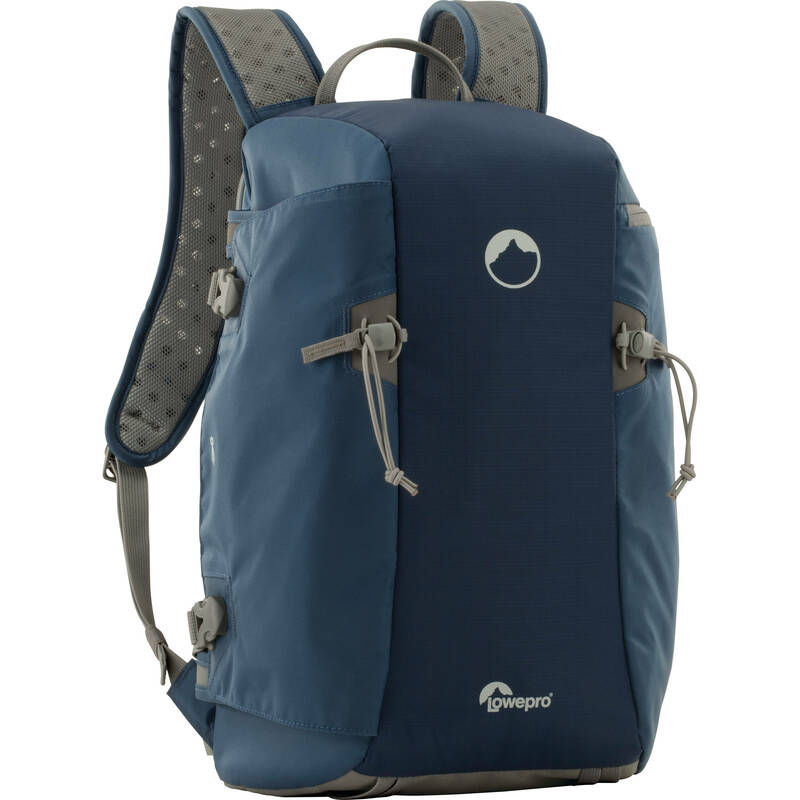 The blue/light gray Flipside Sport 15L AW Backpack from Lowepro is a lightweight technical daypack for the outdoor shooter who needs to carry his gear in rough venues while maintaining the ability to gain rapid access to it. This pack allows you to pack your pro DSLR with grip and up to a 300mm f/2.8 lens attached making it a great choice for the nature or sports photographer. It will also accommodate an extra 1-3 lenses or flashes as well as your tripod or monopod. Plus, since Lowepro understands that remote locations don't often have water fountains available, the pack will hold an optional 1 liter hydration reservoir. Box Dimensions (LxWxH) 16.5 x 10.0 x 8.3"
Flipside Sport 15L AW Daypack (Blue/Light Gray) is rated 4.5 out of 5 by 107. Rated 4 out of 5 by Brigs from Great Daypack I bought this pack to use while I am living in Yellowstone for the summer. I had been using an Osprey pack which was really a great pack but there was no way to properly protect my camera. This Lowepro is the perfect size. I am able to put my 100-400 lens with a hood on my 50D and it's fits perfectly. It also allows for enough room to have my 18-200 lens and a few other things like a sandwich, snacks etc. I don't typically carry a tripod so I used that compartment to house my rain jacket. One of my favorite features is the space for the water bladder not to mention the attached rain cover. Very cool. This is a great daypack. Rated 5 out of 5 by Fiddy the Photography Student from Perfect for a day hike I purchased this pack to carry my photo gear whenever I go on hikes and so far I love it. It's light and spacious enough for my gear. I'm digging the dedicated tripod slot/compartment. I don't have a water pouch, but the pocket it goes in fits my water bottle perfectly. I also really like the straps (shoulder, waist, and chest), as they keep the bag around me securely whenever I feel like stepping my walk up to a run; the waist strap also lets me bring the bag around to access my camera gear quickly and easily without putting my bag on the ground. I've yet to try it out in the rain, so I'm not sure how the waterproof material holds up. Rated 4 out of 5 by Stuart from Great size for most uses I first purchased the 20L and found it too large with more compartments that I needed and excess depth. I then bought the 10L and found it too small. It was really small and things were too tight. My 5D with an attached Black Rapid strap would barely fit inside and my Gitzo Traveler tripod would not fit into the tripod carrier. This 15L was just right (like the story of the three bears). I recently took it on a trip with my 5D and attached 24-70 lens, tripod, 600 EX flash and extra lens (16-35). I had extra room for my black rapid strap, power bars and lens cleaning equipment. I think this is the pack size is right for 90% of users. Rated 4 out of 5 by Clickchick from Nice pack, a few criticisms I own Lowepro bags ranging in price from this one up to $400, and I am excited to try this out on a hike tomorrow. Love the water bladder space (finally) and the non-black color (black is hellishly hot on the trail). A couple things I notice INSTANTLY that I am very surprised about are that there are no accessory pockets and that the shoulder and waist straps are VERY cheaply constructed and thin. What happened to the padded straps on any nice daypack, including all of Lowepro's other packs? Next go around, please pad the straps better and add the front pocket that the other Flipside bags have. Add padding on the hips where the pack should rest. Rated 5 out of 5 by Amy K from Awesome Daypack The Flipside 15L AW Daypack is really awesome for your day hikes. I've read reviews that it is not large enough. As a rookie photographer, it works out great as I go hiking. I can fit the camera with telephoto lens attached, an additional lens (or two if no flash packed)and my extra battery, user manuals, sd cards, cleaning kit and also a plus: my tripod! There is room to include your drivers license if needed as well as a credit card or two. This pack also has an inclement weather cover included. There is also a pouch for a 1iter water bladder. What more could you want while day hiking? Love the Lowepro 15L AW Daypack! Rated 5 out of 5 by bill photo bum from lowepro flipside sport I've had this backpack for a few weeks now and am quite pleased with it. It holds my canon d70 with the 70-300mm lens, plus two pairs of binoculars and the 18-50mm lens in well padded compartments which are adjustable to fit the equipment inside. I also have a tripod attached to the outside of the pack. I've been caught out in the rain with the pack and with it's waterproof coverings all the equipment stayed dry. The equipment is easy to get at although you do have to take the backpack off. but this only takes a few seconds. I would recommend this pack to anyone interested in carrying a load of camera equipment comfortably and keeping it dry in case of a sudden downpour. Rated 4 out of 5 by Dino from Lowepro Flipside Sport 15L AW Review I really like this pack! It's comfortable and the perfect size for my Canon T5i, Canon EF-S 18-200mm & Canon EF 100-400mm lenses, and associated cables and chargers. The ability to unshoulder and swing it to the front to access the camera and lenses while hiking is a great feature. The additional tripod/monopod and hydration pockets are very useful. Aesthetically it's a little blocky but I'll accept that easy tradeoff for the great protection of my equipment. The one design addition to get 5 stars would be one or two zippered pockets on the back for smaller, flatter items like a traditional day pack. All in all, it was a great buy, especially as I got it on sale! Rated 5 out of 5 by John from Great for long telephoto I wanted a bag I could conveniently carry my Sigma 120-300 2.8 Sport, a body and at least one other smaller lens. This bag fits the bill and then some. This bag fits the 120-300 2.8, my D810 with grip and another lens. I will probably carry the Nikon 24-70 2.8. I also have enough room for extra memory cards, and cleaning supplies. This bag also features a water bladder pocket. The description states 1 liter, but I can fit the 1.5 liter camel back with ease. The pack will also carry a travel tripod but I am going to use that storage for my monopod. This is a great case with not much bulk. This will keep me satisfied for an extended time out shooting auto racing. Will this fit for my D7100 with attached battery grip and atathced 500mm f/4G ED VR Nikon Lens? Asked by: Teddy Jr. C.
The 500mm f4 G appears to 15.4 long. The the longest interior dimension of the 15L is only 16.1 so I suspect it would not be long enough for your purposes. The bag is deep enough that the camera will fit in the bag positioned on the end (i.e. USB input side down) so separately the combination would probably fit. For that reason II use the 10L version of this bag most of the time as I tend to put too much in the 15L. You might check the B&amp;H website as there are several products out there that are designed specifically for camera/long lens combinations. I have had very good results calling B&amp;H and asking for advice. I have never gotten bad information from their sales staff and they are always VERY willing to help. Good luck. will this take a Nikon D4 with 300 2.8 lens fitted? Can you use this backpack as a slingpack? No you cannot. Its a traditional backpack design with a weight distribution belt around the waist. There are product videos available online, It will give u a clear picture of the backpack. Will a Canon 7D with Tamron 150-600 lens fit in this bag? Asked by: MIGUEL ANDRES A.
Mmmm... not sure! I would ask B&amp;H by phone to make the test!Or maybe there is mesurment on description?